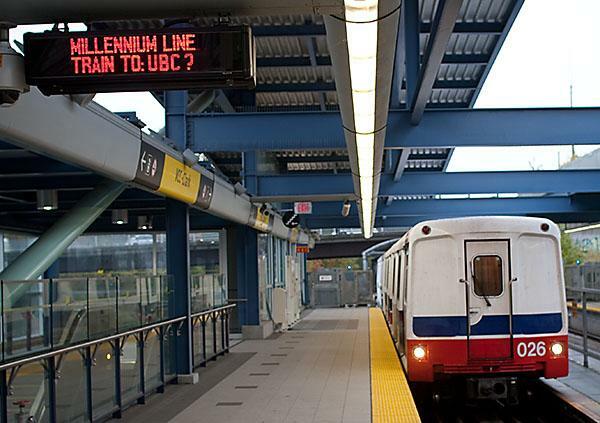 The UBC Board of Governors (BoG) has approved a motion to support the Millenium Skytrain Line’s expansion to campus, as of its April 19 meeting. This would in turn require approval from the province, the BoG and other campus stakeholders. Accordingly, Steenkamp indicated that changes are not likely to come until at least 2020. Steenkamp: Funding must not affect UBC's academic mission, has to be in consultation with Musqueam nation and enable formal role of UBC in design and project approval. Students have been the most effective advocates for rapid transit and we look forward to working with them. The expansion would be accompanied by advocacy for two on-campus stations, which would be completed by 2028. Three other stations located at Sasamat, Alma and MacDonald would connect UBC to the Arbutus station. The decision followed the BoG’s official endorsement of UBC’s Strategic Plan, which includes “sustainability and connectivity” among its priorities. “Extending rail rapid transit to UBC is a key component of a regional approach to transit improvement, and directly supports UBC’s Strategic Plan,” said President Santa Ono in a press release. Previously, the university declined to finance the expansion of the Skytrain beyond its move to Arbutus and Broadway. Even when the Millenium Line’s extension was announced by Vancouver mayor Gregor Robertson in January 2017, there was still uncertainty about its linkage to UBC. Instead, the line was only slated to end at Arbutus and Broadway. Translink CEO Kevin Desmond said at that time that an expansion to UBC was likely inevitable — but was unsure when it would happen. Now, the expansion of rapid transit signals to UBC the possibility for further campus development. Steenkamp indicated that better transit integration would increase the potential revenue UBC can make from surcharges on development and land lease sales on campus, allowing it to recoup any expenses incurred by the expansion of the line. There is also the possibility that it would secure more funding for other projects like affordable housing, especially as many community members face long commute times. “What I’m personally so excited about on this is the contribution to connectivity issues and commute times and all that, and of course the sustainability clause with reducing greenhouse gas emissions,” he said. AMS VP External Sally Lin confirmed rapid access to campus is becoming increasingly important for students. With support from the BoG, more discussions will be held to figure out the technical details around the expansion of rapid transit to UBC. “We have a lot of technical work to do in figuring out what this will cost, what it would look like, what the technology options are ... and then we have to start developing a proper business case,” Steenkamp said, adding that the university would start the conversation around the Land Use Plan in August 2020. While appreciating UBC’s decision, TransLink spokesperson Jillian Drews similarly acknowledged that more will have to be done to make rapid transit expansion to campus a reality. “It’s great to see UBC’s commitment to extending rapid transit to their campus in the future, and we look forward to more discussions,” Drews said. Drews also noted that Translink is currently focusing on the Mayors’ 10-Year Vision, which only provides “preliminary planning for a UBC extension, not construction.” But there could be more consideration for the UBC project in the development of Translink’s new Regional Transportation Strategy. Steenkamp: Can't give the precise number because we are still estimating costs of the extension, we estimate we would pay part of the 20 per cent regional contribution shared with the city of Vancouver. Current extension costs about $3 billion if that's an indication of scale. Moving forward, Steenkamp noted that UBC has been and will be “leaning pretty heavily on the student voice” to advocate on this issue. For instance, the AMS — among other campus stakeholders like staff and faculty — has advocated for the expansion for years, citing a need for quicker, more accessible transportation to UBC. “I would say that without the student support, I doubt whether we’d be proceeding as boldly as we are proceeding right now,” he said.